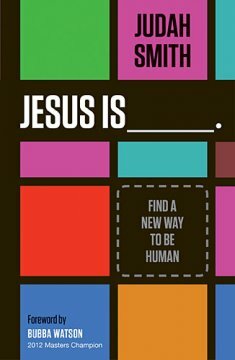 Must Read Book: Jesus Is _________. I like to read, but I’m going to keep it real. I don’t read a lot of books…blogs yes…books no. I’m not sure if it was the massive amount of buzz it had in my twitter feed, the mod cover, the snappy title, or what that made me have a burning desire to hunt this book down. But this chick does not venture through more than one store, dragging her husband along the way, to find many things…especially a book, but I did! And even more surprising – I read it! And wrote notes in it! This is serious. I don’t even know where to start about how simple a read it was. If you are new to the whole “Jesus thing” or if you are a “seasoned saint” there is so much to learn here. As I grow older…look at me acting like I’ve wisdom beyond my years…I’m realizing that the box I put Jesus in through my life was beyond ridiculous. I judge…a lot. Sometimes I still do…hey! no one is perfect. But God used parts of this book to help me see how amazing the love is that Jesus has for each of us. One of my favorite parts of the book talked about reaching others. Jesus’ message is simple: God loves you and wants a relationship with you. People: we complicate it! We throw up all of these restrictions and weird rules in order to reach Him and to reach others for Him. We say that Jesus wants everyone to come to Him, but then when someone shows up at our church that may not fit our happy church mold we don’t welcome them. We assume the position: God wants you; just not at my church. If you want Jesus you are going to have to shape up before you go forward and accept Him – I know your Facebook profile, I follow your Twitter feed, and there is no way you can say you want Jesus and really be serious about it! Seriously!?!?! Now if there was ever a moment for us to as Christians say WTF (what the faith? yes I used it…judge me) then this is it! Jesus hung out with the lowest of low; why? because they need Him! We all need Him! But who understands sin better than a sinner who isn’t pretending to be a saint? So I’m not going to summarize the entire book for you. Just know that it is an easy read, and it is a read that anyone who has been a Christian for a while needs to read. So often we get wrapped up in our little bubble and forget that Jesus told us to be witnesses…and that does not mean stay in your Christian circle and ignore everyone else around you. If you want to learn more about the book you can do so here. If you want to order the book you can do so here.